Summary: The peak oil hysteria provides rich lessons for us today about learning from activists and the value of listening to our major professional institutions. Easy cynicism led people to believe outlandish forecasts, wasting valuable time and resources. Worse, we have had many such barrages by doomsters — aided by their clickbait-seeking enablers in the media — which have left us almost numb to warnings, no matter how well-founded. We can do better. Where were you during the peak oil hysteria? It began in 2005 and died in 2013, marked by the opening and closing of The Oil Drum website. Despite their analysis and forecasts proving to be mostly wrong, most of their authors are still “experts” publishing elsewhere (see this bizarre example). That follows the pattern of modern American doomsters, such as those in the 1970s who predicted global catastrophes from pollution and famine. Perhaps the activists predicting a climate catastrophe will add their names to this list in the next decade. It’s not just historical trivia. We must learn from these bouts of irrationality if we have any hope of regaining the ability to govern ourselves. Memories have faded, but a decade ago the predictions of end of oil were hot news. Comment threads overflowed with people terrified of the future. Conferences were held and books sold trumpeting certain disaster as the lifeblood of our industrial civilization dried up. Many of the following names were highlighted in journalists’ Rolodexes as the go-to people for hot quotes. Then as now, the names least often consulted proved to have the more accurate forecasts. 2005 – Pickens, T. Boone (Oil & gas investor). 2007 – Bakhitari, A.M.S. Oil Executive ((Iranian National Oil Co. planner). 2007+ – Groppe, H. (Oil / gas expert & businessman). 2007 – Herrera, R. (Retired BP geologist). 2008+ – Westervelt, E.T. et al (US Army Corps of Engineers). 2009 – Deffeyes, K. (retired Princeton professor & retired Shell geologist). 2009 – Simmons, M.R. (Investment banker; see the posts about his work). 2010 – Goodstein, D. (Vice Provost, Cal Tech). 2010 – Wrobel, S. (Investment fund manager). 2010 – Bentley, R. (University energy analyst). 2010 – Campbell, C. (Retired oil company geologist; see the posts about his work). 2010 – Skrebowski, C. (Editor of Petroleum Review). 2011 – Meling, L.M. (Statoil oil company geologist). 2012 – Koppelaar, R.H.E.M. (Dutch oil analyst). 2012 – Pang Xiongqi (Petroleum Executive, China). 2015 – Husseini, S. (retired Saudi Aramco). 2020 – Laherrere, J. (Oil geologist , France). 2020+ – CERA Energy (consultants). 2020+ – Wood Mackenzie (consultants). 2030+ – EIA and IEA. No visible peak – Lynch, M.C. (Energy economist). These predictions were made during 2003 – 2008 (collected by Robert Hirsh; most sources are listed here). Most were given with qualifying language expressing uncertainty about the dates. Some of these people, especially those associated with the Peak Oil movement, had given different dates — moving them out as time passed. Most of these are documented, but details of some have been lost over time. Note that the forecasts of major energy agencies’ look good a decade later. Much as with climate change, activists disparage (often contemptuously) analysis of the professional institutions — but in hindsight it is clear who we should have listened to. Let’s look at these predictions in the context oil production history. The following table shows the actual production of crude oil and liquid fuels — and the IEA forecast for production in 2015 from their World Energy Outlook 2008, published as energy prices were on their way to a record high? Eight years later, how accurate was IEA’s forecast? It was eerily accurate — somewhat accidentally, as the IEA did not foresee the 2008-09 global recession and so over-estimated GDP growth. Note: the IEA and EIA use similar definitions for “liquid fuels”. Historical data from the EIA website. * The 2015 total is for Q3. The bottom line: liquid fuel production increased by 15% during the decade after 2005, so that prices have plunged (exacerbated by the Saudi price war). Prices will remain under pressure unless OPEC reestablishes its control, production coming online from investments in the giant fields of Iran and Iraq, the spread of fracking to other nations, and new tech (e.g., hybrid and electric cars). Also note the increasing difference between production of crude oil and all liquid fuels. The rise in crude oil and, more broadly, liquid fuels were driven by new sources whose potential was mostly ignored by the Peak Oil doomsters). Crude production rose from deepwater and fracking wells, plus mining bitumen (aka oil sands, which technically does not produce crude oil). Liquid fuels production rose from production of natural gas liquids, biodiesel, ethanol, and those converted from coal and gas. Most numbers you see for “world oil production” are for all liquid fuels. While in 2008 the IEA accurately estimated liquid fuel production for 2015, they over-estimated demand. As a result, the WEO 2008 price forecast for 2015 was too high. Increased efficiency of energy use — as consumers and businesses invested to increase the efficiency of the more expensive energy (and R&D produced more ways to do this). Increased production of oil (boosted by R&D making more “resources” into usable “reserves”. Today’s $30 oil shows that production growth has exceeded demand. New sources of liquid fuels — including both new hydrocarbon-based supplies (bitumen in Canada and Venezuela), new carbon-based fuels (e.g., coal to oil, although oil prices never rose to make this viable), and new carbohydrate-based supplies (e.g., ethanol from corn). Only time will tell about the IEA’s forecast for 2030 of $122 oil (in 2007 dollars). But today’s oil glut gives us an opportunity to prepare alternative supplies in an inexpensive and orderly manner, not only reducing the risk of energy price shocks but also reducing pollution and the risk of unpleasant anthropogenic climate change. Let’s make use of the gift. Equally important is that we learn from this experience with the peak oil movement. Activists and enthusiasts have terrible track records at long-range forecasting, despite their confidently loud predictions of doom — echoed by clickbait-seeking journalists . That does not imply that we should blindly trust major institutions (as the scandal about Flint’s water supply shows), but skepticism pays large dividends and allows more rational preparing for the future. For a deep look at these issues see Exxon’s new report “The Outlook for Energy: A View to 2040“. Important: Recovering lost knowledge about exhaustion of the Earth’s resources (such as Peak Oil). The three forms of Peak Oil (let’s hope for the benign form). To learn about the minerals that power our world, and will for many years more, I recommend reading the IEA report Resources to Reserves 2013. Here is a brief slidedeck of its contents. For a deeper look, see the IIASA’s Global Energy Assessment (a widely cited source document, including by the IPCC’s AR%). Here is a 113 page summary. There is a typo in the first para — I believe you mean 2005 not 2015. I would add a fourth effect, although it is not as great as the first three, the increasing research and use of renewable (so-called “clean”) energies. The increase in efficiency of solar and wind power collectors over the last 10 years has been nothing short of amazing. These energy sources will never be “the” answer to all of our energy needs but some regions of the country are currently generating 15-25% of the electrical power (which is a relatively small subset of the total power consumption) consumed by buildings using renewables. This reduces the stress on other energy sources and buys us more time to find better and more comprehensive solutions. Solar and wind are not replacements for oil (large numbers of electric cars will change that, 1 – 3 decades from now). Oil has not been a major fuel for generation of electricity in the developed nations for decades, so the increased cost of oil had little effect on the development of solar and wind. It cost us $4 trillion to keep production stable, however. First, giving economic numbers without specifying a time is meaningless. Over a day, a year, a decade, a century? Second, expressing them without details — world or US — and without reference (big number! Wow!) is meaningless. Third, the actual situation: global capex for the oil & gas sector was about $600 billion in 2015 (estimates vary). World GDP at PPP is over $100 trillion per year, so that’s less than 1% — appropriate for capex in one of the world’s key industries. Right, the oil majors have to spend much more for new oil. Capex productivity going down significantly. It’s good to know that the folding of a website signifies that we will have plenty of a finite depletable resource for decades to come. Hopefully peakoil.com will fold so we can increase our production further. I have no idea what you are attempting to say. From your next comment, I suspect you are just another person filled to the brim with myths from The Oil Drum. Predictions, forecasts, anticipating future events – they have the same appeal as gambling does. Drama, excitement, passion – and danger. We know that gambling is an emotional exercise, not a mundane intellectual game. You have to intuit what the other will do, read his body movements and expressions more than mathematically determine what cards he holds. The score is a personal triumph – of the spirt, not the mind. Those making predictions have their personal image vested in the outcome. The more aggressive, the more drama, the more winner-takes-all feeling there is. Which is why they fail, as well. They are using “instinct” to interpret trends rather than facts. Erhlich with his famines in 1975 has got to be the best-representation of the phenomena. He was passionate to the point of madness, and yet he is still highly revered. Why? Because he believed. I don’t think it was that he believed in the “cause” of environmentalism, but he believed in his vision. We respect that. A glorious failure, but glory nonetheless. And terrific drama. End of oil! Planetary-level biocide! The end of civilization! The excitement changes names, but is it any different other than sophistication from Mob Wives? What Harold Camping brings to his followers is what the Peak Oilers bring to theirs: a sense of specialness in their time, their persons and their future history. Better than a war – heroes everywhere, but nobody dies. Obviously the failure of forecasts has technical aspects. Not doing your homework or doing just enough to argue well, preaching to a popular theme, confirmation bias, positive financial and social benefits and feedback. But the drama and perceived importance underlies it all. Nobody gets interested in a forecast that soybean futures will rise 11.3% next year (except the Warren Buffets). We don’t even remember those. The forecasts we look to – and more importantly, look FOR and want to be remembered for – are the game changers. It’s a gamblers’ world at the top. The strident pull us out of our ordinary lives and expectations which, truth be told, we prefer to have UP TO THIS POINT. But we want drama in our future lives. We get a jolt when we or others roll the dice, even if we are not aware that is what they are doing. We don’t even care a lot if their track record is crap. It’s the drama we like. I can’t disagree with your analysis, however depressing I find it. The cost of our preference for drama over reality is high, as our love of doomsterism — shared by both right and left, albeit preferring different stories — cripples our ability to deal with real threats. I don’t know what you mean by that. I don’t know how the 1% (the bourgeoisie) or our political and business elites (the Inner Party) think, or the degree of their belief in the fads and fancies that obsess the Outer Party (America’s managers and professionals). They might just be feeding our delusions as a means to control us (if so, it’s working). Guessing, I suspect all this leaves the proles (the lower middle class and poor) unaffected. In a finite world with finite resources and an ever rising population, all the predictions that you scoff at for not having come true at a certain point – will ultimately come true. Wishful thinking can’t make infinite consumption of a finite depletable resource go on forever and it can’t make a finite amount of land produce sufficient crops for an infinitely growing population. Time and magnitudes are the key factors in life. “All that lives, dies.” But it does not necessarily happen now. You obviously have not read the post. I suggest you do so before posting such obviously false comments. I’m not an expert, but I used to follow the oil drum with interest. The impression I saw communicated there was that it’s hard to predict the exact timing of the peak (naturally everyone enjoyed trying to do see if they could), but that peak oil would be characterised by *cheap* oil; or in particular, a wobbling situation of high/low prices over many years, nuanced by many things such as future politics and technical discovers that provide a breathing space, followed by a collapse of oil prices. Basically if people can’t afford expensive oil then you have to sell it cheaply and jettison future exploration and maintenance in its place. There’s little in today’s oil situation that contradicts this idea, with the recent period of cheap oil following high prices entirely concordant with it. I followed it closely, and don’t remember seeing anything like that. Also, it violates rule one of economics: stable or rising demand and shrinking supply = rising prices. There are quite a few errors in that one sentence. There is no evidence that people “cannot afford” oil at any price its been at during the past several years. Production is rising, just doing so faster than demand. The world economy continues to grow, albeit slowly (not surprising after the fantastic pace of 2000-2008. E&P is falling as it often has in this cyclical industry — in response to price. So far this is like the massive oil price cycle from 1980 to 1998 (aprox), just faster. I see that you mis-learned much from The Oil Drum. I suggest reading the reports by the EIA and IEA, or a respected energy economist (e.g., James Hamilton). I recommend distinguishing between the models for conventional “crude and condensate” versus alternative fossil resources. ExxonMobil’s 2016 Outlook Fig. 62 clearly shows that “crude + condensate” peaked about 2005/6. ExxonMobil projects that to decline through 2040. (That after previously strenuously denying such predictions lest such admission harm its stock price.) Note the strong decline in conventional fields that new discoveries of “crude+condensate” are not expected to overcome. Even adding in “Deepwater production” and discoveries still does not bring future production up to a plateau or “no decline.” Thus, I find your evaluation to be too optimistic. All the growth is from other resources – bitumen (aka “oil sands”), tight oil (from fracking shale), natural gas liquids (NGLs again from fracking), with small increases from “other” and “biofuels”. Yet the higher costs, especially conventional, deep water, bitumen, and tight oil, are dampening the economy and hindering growth in developing countries. e.g. Gail Tverberg at OurFiniteWorld shows 7.8%/year demand growth for 1965-74, but only 0.8%/year growth for the last decade. In “Oil Prices, Exhaustible Resources, and Economic Growth*”, James D. Hamilton (UCSD) graphs the production of the US States showing almost all have already peaked and declined for their region. Geology-area still rules. I recommend you examine “multi-Hubbert” modeling – where each resource-region is separately has its own growth, max, and decline, and can be modeled accordingly. That will give a much better grasp on future production and challenges. Thanks for the pointer to this excellent report. I added it to the For More Info section. I do not see specific objections to what I said. You appear to have been reading The Oil Drum, and so have some fundamental misconceptions. You misunderstand the meaning of “conventional” and “unconventional/alternative” extraction methods. They are labels describing the state of art at a given point in time — changing as methods evolve — as they have throughout history. Deepwater and tight sands are unconventional now, but to the next generation they’ll be conventional — just as offshore, secondary and tertiary recovery, arctic, and deep well were all considered “unconventional” when introduced. You confuse the extraction methods with the mineral extracted. Here is figure 62. Deepwater and tight sands produce crude oil. Unlike oil sands (bitumen), which are refined into petroleum products but are not crude oil in the usual meaning of the word. No matter how often wrong, true believers go back to the same well. > These were new sources, whose potential was mostly ignored by the Peak Oil doomsters): natural gas liquids, biodiesel, ethanol, and those from coal, gas, and bitumen (aka oil shale). That last (bitumen = oil shale) is incorrect. Bitumen usually refers to tar sands, and IS included in crude oil figures. The meaning of “oil shale” is muddied by the media a lot, but if you meant US tight oil, that too is included in crude oil figures. No one is really producing oil from actual oil shale (aka kerogen) in large quantities (too expensive), so I’m not sure what’s meant by your statement. > Increased efficiency of energy use — as consumers and businesses invested to increase the efficiency of the more expensive energy (and R&D produced more ways to do this). Energy efficiency hasn’t made a great deal of difference in consumption due to Jevons Paradox. There aren’t any figures available to support your point, as far as I know. > Increased production of oil (boosted by R&D making more “resources” into usable “reserves”. That’s completely incorrect. The rate of global oil production growth hasn’t changed significantly in the last ten years. And it wasn’t R&D that made sources like US tight shale productive, it was the higher prices of oil (as we saw by the complete collapse in drilling when the price of oil dropped pat $80/barrel). It’s true that reserves increased when the price climbed; it’s also true that they’re now going to sharply decline because of the fall in price. At current prices, a full half of the world’s crude oil reserves are about to be taken off the books. > Today’s $30 oil shows that production growth has exceeded demand. Or that demand has dropped below production, which seems more likely. All industrial commodity prices are collapsing, including oil, due to global economic growth slowing. It isn’t because there’s been a unusual surge in oil production. None of these are new sources of fuel, all have been known about for a long time (the Nazis powered Germany with coal gasification, for example). They’ve just been too expensive to compete with crude oil, at least until the price shot up. Now that the price has collapsed, they’re all non-viable economically again. > Equally important is that we learn from this experience with the peak oil movement. Activists and enthusiasts have terrible track records at long-range forecasting, despite their confidently loud predictions of doom — echoed by clickbait-seeking journalists . Of course predicting the timing of peak oil is difficult – it depends on technology, politics, the economy, geology, and a number of other complex system. I’d argue that denouncing peak oil predictions, as you have here, is also fraught with difficulty, for the same reasons. However, before assuming that “no peak oil’ is a faite accompli, consider that global oil production is currently declining, that nearly every major player in the industry is predicting low prices for the foreseeable future, and that only about half the oil in the world being sold right now is making money. Future oil development has completely stopped, with capex for E&P slashed by everyone, and that every available data point indicates falling production levels from here on out. It seems that many on the web are assuming that a collapse in oil prices of this magnitude means that there’s an abundance of oil. Instead, it may be the indication that we’ve just seen peak oil, and are beginning the downward production slope. Your reply is almost entirely wrong. I’ll give a few examples, since experience has shown that my effort is wasted. I meant what I said: “These were new sources, whose potential was mostly ignored by the Peak Oil doomsters”. Can’t be clearer. (Nice catch that I said shale but meant sands; I fixed it). An odd comment, since I showed EIA data that proves otherwise. False. It was new tech and method, which were in turn driven by higher prices. Which was my point. False. Only a small fraction of daily oil production can be stored — unlike minerals, where inventory stockpiles can become a multiple of annual production (e.g., gold). They are new sources in the sense that their flows are new. I believe that was clear to most people. You should have told the Peak Oil community that. Not only were they highly confident in their predictions, many said that oil production had already peaked. Even for peak oil cultists, that is weird. A sure sign that we’re dealing with a pseudoscience or religious belief when it is not falsifiable. To peak oil believers rising prices show the approach of peaking — as do falling and low prices. Well OK, then. Re: “You misunderstand the meaning of “conventional” and “unconventional/alternative” extraction methods.” Your objection is essentially the logical fallacy of “moving the goal posts”. (You presume too much. I have a patent on bitumen recovery and applications for CO2-EOR). I distinguish between Areas: Oil Well, Field, Region, State, Country, each of which will show rising, maxing, and declining production for any given resource and technology. I distinguish resources: light oil, heavy oil, versus bitumen, and kerogen. I distinguish resources by permeability: sand, carbonate, shale. Each of these show “Hubbert type” curves. Thus the need for “multi-Hubbert” type combinations. US conventional oil in the 48 states still peaked about 1970. See James Hamilton reference. Fracking tight shale is another resource with its own curves. etc. Commodity price boom/bust from a +/- 1.5% supply excess/shortage is negligible compared to a 4-5%/year decline and the need to replace that. i.e. we need a new Saudi Arabia worth of oil production every 2 years just to keep up existing oil depletion. Focus on depletion and what is needed to replace that – AND provide sufficient transport fuel for rapid economic growth of developing countries – not the current stunted growth. “Conventional” and “unconventional” are terms whose exact meaning change over time. Why that bothers you I don’t know. The rest of your comment has zero relevance to anything I said, other than to show that you didn’t read my post. Since you are obviously not going to do so before posting more very long irrelevant comments, I’ll show you the money paragraph from the conclusion. > I meant what I said: “These were new sources, whose potential was mostly ignored by the Peak Oil doomsters”. Can’t be clearer. (Nice catch that I said shale but meant sands; I fixed it). I meant that I didn’t understand what you meant when you said “oil shale”. However, the tar sands weren’t ignored by peak oil analysts – for example, it figures prominently in Campbell’s 1998 Scientific American article “The End of Cheap Oil”. Nor is it a new oil source. We Canadians have known about it for decades now, it was just too expensive to extract before the 2006 price climb. > An odd comment, since I showed EIA data that proves otherwise. No, you showed EIA data that showed growth. I said that the rate of growth hadn’t changed. As you can see here (http://i.imgur.com/2dGJNo0.png), we haven’t suddenly had an increase in the rate of production. Production growth has been very steady. > False. It was new tech and method, which were in turn driven by higher prices. Which was my point. Actually, fracking and horizontal drilling have been around for more than fifty years. The technology isn’t that new. If it wasn’t the high price of oil, then why did drilling collapse when the price of oil fell past $80/barrel? If new technology has made all this possible, then surely a drop in price wouldn’t affect new projects by much. What’s happened is that the industry itself told us a year ago that sub-$80/barrel meant that tight shale was unprofitable. > Even for peak oil cultists, that is weird. A sure sign that we’re dealing with a pseudoscience or religious belief when it is not falsifiable. > To peak oil believers rising prices show the approach of peaking — as do falling and low prices. Well OK, then. The reason why the price of oil has stayed as high as it has in the last several years is because of the effects of quantitative easing and ultra low interest rates. If it weren’t for these, oil prices would fall, because consumers would need to pay much more for goods bought on credit, leaving less for the purchase of oil products. … Because of the expectation that Quantitative Easing will end by October 2014 and the pressure to tighten credit conditions, my expectation is that the affordable price of oil will start dropping in late 2014, as shown in Figure 13. As it turn out, she was right on the money. The general trend can be expected to be downward, because even if oil prices rise when the economy is functioning fairly well, at some point, the higher price leads to adverse feedbacks, such as consumers defaulting on debt and cutting back on discretionary purchases. The result can be expected to be recession, and again lower oil prices. The big danger is that lower oil prices will lead to lower oil production, and this lower oil production will become a problem for business and commerce around the world. This is a full year and a half before the price collapse. To tell you the truth, I don’t think that you understand peak oil theory as well as you think. Or, at the very least, you’ve picked the wrong analysts to pay attention to. I’ve lost interest in this, but I’ll note a few points. You facts are largely wrong. Correction noted. But that is not relevant to anything I’ve said. Production has risen to meet demand, easily (i.e., since prices have fallen). Missing the point. Tech seldom suddenly first appears in practical form. The origins of the method go back to 1929 or before. But tech evolution made it sufficiently practical to use widely only beginning in the 1980’s —after which its use accelerated. For more examples see “11 Modern Technologies That Are Way Older Than You Think“. Every industrial technology has a point at which it becomes uneconomical, no matter how old and mature. I can’t believe I have to point out all these obvious things. Commodity production must equal demand plus change in storage. For oil (a liquid) commercial storage is tiny as a fraction of production, so production cannot exceed demand by much or for long. Why isn’t this obvious? First, only a small fraction of oil is used for industrial production. Second, the most recent data shows that industrial production has risen while oil prices have dropped — world IP was down 0.4% in Nov, the first drop in a while. No, oil prices will rise so that they are profitable again. Just as it has with every other commodity cycle for thousands of years. As for Tverberg’s analysis, it’s just making stuff up with near-zero foundation in actual economics. Linking the collapse in the world price of oil to the end of QE in the US (slowly reduced from 9/13 to 10/14) is absurd. US GDP has continued to rise, so there is no basis for assuming US economic conditions have reduced the demand for oil. And it has not: US oil consumption was flat throughout 2015 at aprox 15.3 million b/day. Global GDP, oil production and oil demand have been rising. Oil production has risen faster than demand. It’s a commonplace dynamic for commodities. Let’s look at that quote from Tverberg that you consider “right on the money”. It was quite wrong about money (in addition to being wrong about oil consumption, as I showed earlier). It’s just making stuff up. That is almost entirely wrong. neither the start or end of QE3 had much effect on Treasury interest rates, and no visible effect on the rates charged to consumers (the riskless rate plus a credit spread). The rate of growth of consumer credit grew as QE3 was phased out (Sept 2013 to October 2014)– and remained stable (and rapid) after it ended. Outstanding consumer credit grew at 6.1% in 2012, 6.0% in 2013, 7.0% in 2014, and 6.9% in 2015. Oil price dynamics are more complex. High oil prices have worked their magic ,,,, spurring increased production from a wide range of high-cost sources — notably mining of bitumen (“oil sands”) in Alberta and fracking in the US. Today’s low prices make much of this unprofitable. … Has falling demand in the emerging nations crashed prices (we know demand in the developed nations has not fallen enough to cause the change)? That also would explain the fall in copper prices. Has increased supply tipped the balance? 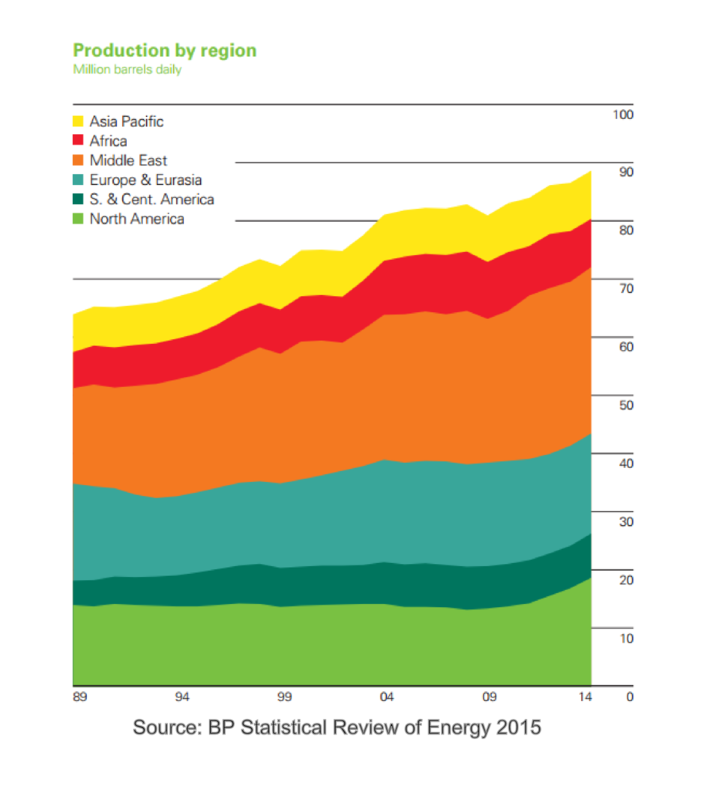 See the most recent EIA report on world oil production. It’s quite stable; no evidence that production caused prices to crash. Lastly, prices will definitely rise again if we have strong enough global economic growth to support sustained higher prices. We’ll have to wait and see if such economic strength is forthcoming. I have no idea what you are attempting to prove with that excerpt, since it agrees with what I’ve said here — and contradicts the specific quotes I’ve given from your comments. Absurd. Prices cannot remain below the cost of production, since the producers will go bankrupt. Even with zero economic growth (i.e., oil demand remains flat), prices will rise to allow E&P to operate at a profit. They’re not charities. Like so many peak oil believers, your reasoning is in defiance of Econ 101. Yes, because you ignore that I’ve shown that many of your key assertions are factually wrong (and ignore the with the supporting links I provide). This is the mark of a true believer — an inability to learn from facts that contradict his or her beliefs. Pingback: Remember when Minnesota Republicans wanted us to be like North Dakota? In the 2004/2005 the status quo was talking about steadily rising oil production into the 2030’s with prices staying below $50 the entire time. Instead, prices soared and production stalled.The status quo was dead wrong in their oil forecast. The increases after 2004/2005 production were from more expensive non-conventional sources (fracking, tar sands) and made possible by the higher prices – and also natural gas liquids (which would not even have been included in “oil production” amounts in previous decades). Prior to the price collapse, the EIA had forecast that the major source of new oil production – US fracking – would peak in 2019. The price collapse may cause a lower but later peak in US fracking, but the issues remains the same – it is a short-term bounty. Tar sands – while very plentiful, can only ramp up at a slow rate – slower than needed to replace the continual decline of existing fields. And new oil field discoveries continue their decades long decline (from a peak in the 1960’s). I think It is unlikely that the future of oil production is bright – or rather, sufficient – despite the current price levels. 2015 is probably the peak of global production. I think only a determined and rapid conversion to electric vehicles will allow future oil production to meet demand. I don’t see that missing a failed prediction of a peak in the production of a finite resource that depletes with usage is evidence that there is plenty more of it. It also shows that you didn’t read the post. Try it. You’ll learn something. I don’t know if you are claiming that you never said (or implied) “there is plenty of it” or you are claiming that you didn’t use the failed predictions as evidence of such. If they weren’t your evidence that we have enough – what was? Evidence of “plenty of oil” would be – big new discovery here and there which more than offset decline rates for years to come, lots of small discoveries here and there which more than offset decline rates for years to come, new way to massively ramp up bitumen (which makes up a huge amount of claimed reserves) processing , new way to massively ramp up heavy oil (which makes up a huge amount of claimed reserves). But we don’t have any of that right now. If the evidence we have plenty of oil is that production has not yet peaked, remember that we are dealing with a finite resource that depletes with usage. What happened in the past is not guaranteed to happen in the future. Your post didn’t address the huge price increase in the 2000’s to the highest plateau ever. The status quo doesn’t address it either. I think without the _temporary_ bounty of fracking, we would be at those levels now. And we will return there as soon as US fracking begins terminal decline in a few years. The good news is that as we have seen, $100 dollar oil cuts demand, which keeps prices from going higher. All I see is that you have not read the post. Try doing so and responding to something I actually said. You’re making stuff up and giving rebuttals to yourself. It’s mental masturbation. Do it elsewhere. so,what exactly are you predicting for the future maximus-you don’t possibly believe that on a planet 7900 miles in diameter has an infinite amount of oil do you.whether or not the oil drum ever existed is irrelevant to the facts.Lots of websites on various legitimate subjects have come,and gone. I suggest you read the post. Your question is answered several times. And also, whether or not someone ever missed a date on a peak oil forecast, is also irrelevant to the facts. But anyone making a case for “plenty of oil” will normally center their argument on past failed forecasts of a peak (or in the case of predictions from many decades ago – “running out”). I have no idea what you are attempting to say, or how your nattering pertains to this post. Please attempt to be more specific, such as by responding to a quote. It sounds like you are talking to yourself. I think you are making stuff up. Please give one example of an expert in energy predicting “running out” of oil. Such a statement displays awesome ignorance of geology. @Editor First, my response was to Maura. She pointed out that the oildrum.com is not relevant to oil supplies. I added that past predictions about oil peaking or “running out” are also not relevant to current and future oil supplies. Any “expert in energy” would have to admit that we started “running out of oil” the minute we began using our first barrel of it. To think otherwise displays an awesome ignorance of geology. The top people – financially, politically, militarily- have all got “enough” already. They have no real downside to their decisions. The upside is an improvement to their standing – the same way sports figures vie for the top salary, not because they need or even use the extra money, but because salary is the scorecard by which society recognizes their relative value. How they get that extra standing is by using the resources at their hands to “bet” on what is going to happen that will, through success, will show how clever they are relative to their pack.. The idea would be fine except that the “resources” they use are not personal but public. I say public because the stocks they buy and sell, companies they merge or collapse, assets they exploit or deny, are largely publiclly owned. The repercussions of bad deals cost the lower levels jobs, homes, retirement plans, marriages and families. Their attempts at “improving” their standing are gambles – where is high return where there is not high risk? – that come at our, not their costs. While they may grumble at the failure, they do not go homeless, suffer a retirement as a greeter at WalMart, or lose their legs in an IED in the Helmand Province of Afghanistan. Two examples from my life in the oil patch: early 1980s, Texaco decided to buy Getty Oil’s assets in Canada even through Penzoil already had a signed purchase agreement with Getty. Texaco gave Getty an indemnity to get him/the Company to break the deal. Penzoil sued, of course, and won. The result was that Texaco had to sell its Canadian arm to Esso for some $2 billion to pay the fine. All the Texaco employees were absorbed by Esso, but of course many were redundant, and Texaco stock fell. The 3 people at the top of Texaco had nothing happen to them – it was just a deal that should have been tried in a different court, they said. Bad luck. Yeah, for the little people. Second example: 2007ish, Compton Petroleum. Offer from a mid-size to purchase at just under $15/share vetoed by a large shareholder who wanted to hear a “16” in the offer before he would think about it. Every technical person involved knew it was a superb offer. No deal, no other offer, 2008 rolls around and the existing financial situation becomes untenable in the crash. Company goes insolvent, bankrupt and into receivership. All staff gone, all termination packages worthless, all but the first rung creditors not paid. All because a certain rich shareholder wanted not a huge gob of money – we knew what he paid for his stock – but a huge gob and a half of money. He gambled, we lost. And since he bailed on the way down, his losses were actually minimal – not even talking into account stock losses as income tax reductions that we couldn’t access. Those at the top toss the dice to improve their lot because winning under a high risk scenario is a big win. They are not plodders. Buffet throws huge dollars into coal these days because he can, not because he needs to. If his bet is off, shrug. He’ll take the loss and move on, while those who are in his funds now have to work extra years. This goes to the heart of what I have written about before, that the fundamental problem with the top is that their decisions have no personal repercussions. Directors are protected by insurance policies from lawsuits resulting from their actions or inactions. Upper management have termination contracts that give them millions (more personal stories here) even when they egregiously run the Company into the ground. A trader goes to jail for 11 years in Britain for the Libor scam, but the money UBS pays comes from the public company’s cash flow. Nobody at the top loses his house, let alone his vacation property. They gamble but do so with the “resources” of other people. And they ARE gamblers. They are not trudgers. They are not content to grow their position slowly or incrementally. If Chile looks to be going socialist, they don’t let things play out, negotiate with the new plays, they whack Allende, instigate a coup. High stakes poker, winner takes all. Or loses all, but it is someone else’s “all”. Nobody went to jail or lost his job for no WMD being found in Iraq. Lot of people died, though. Others, that is. I bought into peak oil fully at 22 years of age, courtesy of far more intelligent but largely incorrect oil drum analysts. I spent the next 8 years wasting a perfectly good mechanical engineering degree living and working on all sorts of bizarre post fossil paradigms; Permaculture farms, ecovillages, off griders ect. I ended up broke still in debt from student loans and pretty over worked and more less hopeless about living in a future after the fossil fuel paradigm crashes. I’d still be a true believer in peak oil if it wasn’t by an odd twist that I have ended up working off my student loan debt on an oil rig. I’m no expert but a little experience and some additional reading on resource assesments and the process of proving reserves has at least convinced myself that barring unexpected geopolitical crises peak oil in any doomerish context is very unlikely. Not sure where I’m going with this story of my own personal folly other than I certainly have learned to exercise much more skepticism when choosing which “experts” to learn from. There are hundreds of comments to my scores of posts about Peak Oil. Most show, like those here, a disinterest in seeing the facts that contradict their ideology (i.e., certain data about the past). I am confident that these people go off to repeat their factually false assertions elsewhere. That is the rule with most of the 45 thousand comments here, a large fraction of which are by people — left and right — quite deluded about basic aspects of our world. This makes us easy for the 1% to govern; perhaps it means the 1% should govern us. You are one of the few — the very few — who have learned. IMO that makes you one of the elect in America. Congratulations. Thank you for posting about your experience. FM, Though I am relieved to have learned enough to ditch previous bad and horrifying assumptions I don’t think it’s noteworthy. A single convincing lecture by an expert in the field at a young age could have saved me alot of rather unfortunate decisions. There are many reasons IMO why so much disinfo on peak oil exists. Perhaps the least cynical and simplest is that the oil industry is very technically complex and hard to grasp from a macro view. Given its utmost importance in our society its not so surprising it acts as an ink blot test for some very intelligent subjective biases. Perhaps there will come a time were the pseudoexpert disinfo so chokes off the internet that we actually have to become accountable for false facts and keep a tally of our predictions (as I see you do). The major energy agencies and consulting firms published many such reports (see the predictions listed in this post). You just didn’t listen, prefering the more exciting fringe activists. That’s the same today with climate change. NOAA and the IPCC are ignored by activists, preferring to predict colorful disasters. And they get the attention. I am not fond of psychobabble. The past 50 years shows that lots of people prefer exciting quackery to the information of professionals. people’s intelligence and education appear to have little effect on this. There are 45,000+ comments on the FM website, the majority of which are demonstrations of this. I have had many hundreds of conversations with these people, almost 100% of which were failures — as they have no more interest in facts and logic than a Catholic in whether the host and wine actually trans-substantiate into Christ’s blood and flesh. This passive case phrasing is imo not helpful. We are the actors. When we take responsibility for our beliefs and actions, then we will have taken a step towards a better future. I was simply reaffirming that tight shale was the product of high prices, tech improvements or not, and that tight shale was non-viable without those high prices. And that we weren’t experiencing higher than-usual production growth in global oil production. And that oil production will decline if prices remain low. If we’re in agreement on that, great. I seem to recall that econ 101 covers the ability to pay as having a substantial influence on demand, and economic growth would seem to be a large part of that. And to tell the truth, I must have missed the day when it was explained how prices rise simply to prevent bankruptcies on the part of producers. Sounds magical. Possibly even religious. It may be true that we are the actors but if we don’t know we are acting out someone else’s script it matters little. I think we as a country are largely lost in a world where technological gains have greatly outpaced broader social narratives. The vast majority do not understand underpinning technological systems (energy, ag, manufacturing,health care ect) rather than harnessing our tech for the benefit of its people its been increasingly used to line the pockets of its owners. An obvious example is our food and pharmaceutical system. We produce vast quantities of nutritionally devoid food at the expense of the land and the health of the people. But it is very profitable for a tiny few and the spillover health crisis is very profitable for big pharmaceuticals. I’d argue we do this because we do not understand the broad systemic picture and fall prey to manufactured narratives which overhype a positive while discounting the negatives, and challenges to these systems are so ineffective because all the good engineers and scientists who understand its technical intricracies are bought and paid for in an academic system that first divorces candidate scientists and engineers from balancing arts and humanities then indebts them and finally offers them narrow specialized jobs within big powerful self serving industry areas. I dont think we have much hope for self governance while we are both intimately dependent on increasingly complex technological systems and still largely ignorant of the science and technological details of their operation. It matters a lot. We are responsible for our actions of commission and ommission. To say we’re “acting out others’ script” provides a nice excuse, but nobody cares about our excuses. To see the crisis of the Republic see the comments to every post I’ve done about self-government: they’re filled with excuses. It’s our core capability. Despite our delusions, it’s not a competitive edge. People generations have worked under far greater handicaps, against far worst odds. They just did so without our whining and excuses. I agree with the above, but I have to wonder if it’s our “success” that has stunted our ability to act? Prepackaged consumerism may be OK for the gdp but horrible for a populacations will power in the long run. We are too often given our shallow materialistic wants and told what we already believe lest we get upset. Is it any wonder we are largely infantile in matters outside the faux veil of consumer choice? From what I can gather comparing Americans pre WWII and pre well established industrialism to post is apples to oranges. We are now largely soft, engineered consumers even the poorest amongst us. Prior we had a largely agrarian character particularly on the lower levels, self governance was natural and necessary to those people. The consequences of failure to work or failure to address problems were immediate and real. Now the industrial system does not demand this of many of its dependents. I wonder can a populace self govern equitably when so few understand how its systems work nd what is vital to its operation? Why we are like this? That’s over my pay grade to even guess. Not for a long time. The progressive and New Deal eras were accomplished by a mostly urban population. Farmers were half the labor force in 1880. A fifty of the labor force worked on farms in 1930, and that included a large number of part-timers with other jobs. Not sure were I read it but I thought 75% of Americans work was farming or farm related at the turn of the century. I’m off again, thanks for the link. Its useful for me to see how few unsupported assumptions you make or theories you hold. That you do not make a guess at the question of why we are like this is more telling IMO than if you did. I am slowly learning that I can make more progress in understanding the world without such guesses or hunches, even if it does reveal a rather uncomfortable and large swathe of uncertainty and ignorance on my part.